Top 10 SEO tips to get on the first page of google for your keywords. Great you have a nice looking website but get no visitors and wonder why. You need to read this article on the top 10 SEO tips and apply the top 10 tips to your website. First you have to understand a little about SEO and how SEO works. On page SEO is anything you do on your website. Off page SEO is anything you do that is not done on your website. On page is anything that you do on your page. Follow our top SEO tips for your on page SEO on each page you build, this will help your site rank on the first page of Google. The first thing you need to work out is what the page is going to be about. Next find the best keywords for the page and check how many people are searching for those keywords each month. No point in ranking a page for a search term that nobody uses. So how do you find the best keywords, keywords that people search for. I use the keyword suggestion tool on SEO profiler its great. All you do is type the keyword that you would like to use and the tool will give you suggestions of lots more keywords and next to each keyword it suggests is the local and global monthly number of searches made for those keywords. Select keywords that people are using, this way when your page ranks on the first page of Google you can expect to get lots of visitors. 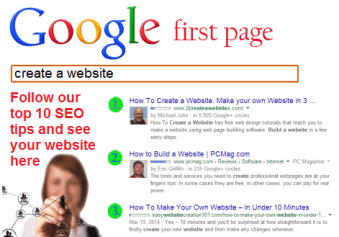 Google has changed and if you want your site to rank your on-page-SEO has to be near perfect. Follow our top 10 tips to get on the first page of Google. Include your main keywords or keyword phrases in all the below tags. Title tags should not be more than 60 characters, include the most important keywords or keyword phrase for the page. Never have two the same they must be unique and well written as they are displayed in search results. Description tags should not be more than 156 characters, and about the page. Remember this is also displayed in search results so make sure its good. Keywords although not used by Google I feel you should still use the keyword tag, most important keywords first separated by comas. Other search engines still use the tag and who knows Google may one day use it again. Heading tags H1 to H6 only use the H1 tag once, again make sure it includes keywords, think of it as the main heading for the page. H2 to H6 can be used more than once and should be used as sub headings for content. When you use heading tags do not have the same keywords more than twice in any of the heading tags or you will over optimise those keywords. Include other words mixed with your keywords and make sure the heading relates to the content below it. Images can be named using keyword phrases, image alt tags should also include long tail keyword phrases, Google can not see images but can read the image name and alt text. By naming images and including your keywords in the image alt text you are telling search engines like Google those words are important. If you have more than one image make sure the image names and alt text are different, never have two with the same text, or you will over optimise those keywords. Less is best when it comes to images be careful how many images you have on your page. Make sure you optimise images to reduce the image file size and keep your page speed fast. Faster loading pages rank higher. Use italic and bold text to make certain words stand out for visitors, search engines will also think those words are important so place a few of your keyword phrases with normal text in italic or bold text. Don’t over do it, the keyword for this page is top 10 SEO tips so I would include the keyword with some normal text see below. Follow our top 10 SEO tips and they will help you rank on the first page of Google. If I just had top 10 SEO tips in italic it would be over optimised. A top SEO tip is to register your domain name for at least 5 years 10 years is better. By registering your domain for 10 years you are making a point to Google and other search engines that you intend your site to be online for a long time. This will score some much needed extra points for your sites SEO when you build your own website. Make sure the URL for the new page you create is SEO friendly. Do not use letters and numbers rather use keywords, from the URL you should be able to tell what the page is about. Example: top-10-seo-tips is included in this pages URL top 10 SEO tips being the primary keyword for this page, simple as that. When you start creating a website remember content is King the more the better. Content is very important you need to have good quality unique content and plenty of it. Each page you create should have at least 600 words I prefer to have a lot more like 1200 to 2000 words, this way you will have a better chance to rank on the first page, as most site owners will only write 600 to 800 words. Another top 10 SEO tip is to start your first paragraph with your primary keywords for the page. If you go to the top of this page the first paragraph reads – Top 10 SEO tips to get on the first page of Google for your keywords…. The primary keyword ( top 10 SEO tips ) is included. Its good SEO practice to have your primary keywords in the first paragraph, as search engines think those words are important. The first part of the paragraph, 156 characters could then also be used in your page description, those keywords would then be in your content at the beginning and in your page description great for your on page SEO. Create at least 50 pages of top quality unique content as soon as you can. Optimize each page for the keywords you would like the page to rank for. Each page should have at least 600 to 800 words more if possible. Never have duplicate content or copy content from other sites. Use the heading tags in the proper order, starting with the H1 tag then use H2 to H6 as sub headings with good paragraphs of unique content under each heading. Add fresh new content all the time and update old or stale content. When writing your page content include keyword rich anchor links in the content to other pages on your site, this will help visitors and search engine spiders move around your site and find more content, improving your bounce rate. In brief – Remember content can make or break a site, you need to try to get a least 50 pages built as soon as you can. Each page should be well optimized for its keywords with plenty of good quality unique content. Be careful how you optimise the page, make sure you keep your keyword density ranges between 2-4% for your targeted keywords. Get a complete SEO analysis of each page you build, with SEO site check up its great and will give your page you test a score out of 100 and show you how to improve your on page SEO. The SEO report is done online and takes a few minutes. Include links to other pages on your site in the content. Once you have 50 pages you still need to update any old content if its stale and build at least two new pages every week either on the site or your blog. When you design a website think about your navigation, how easy is it to find stuff on your site? Menus must be easy to find and visitors should be able to navigate easily around your site. Use keyword rich anchor text in the menus that clearly say what the page is about this will help your page SEO and visitors to navigate around your site. Include long tail keyword rich links in the content from one page to another page. As a visitor reads your content they can then click on a link in the content if they find it interesting and move from one page to another. Make sure pages open in the same window, visitors will click the back button on their browser if they want to return to the page they were on. Each page on your site should be no more than three clicks away from the home page. This will keep link juice high on all pages on your site. Be careful what you have above the fold, make sure you do not have big banners or lots of advertising above the fold this will only damage your chances of the page ranking high. Above the fold is what you see on your computer screen as soon as you come on to the page, its the top part of the page you see before scrolling down. Google has had complaints that on certain websites its hard to find the actual content, visitors have to scroll down past all the ads and affiliate banners to find what they are looking for. So sites that don’t have much content “above-the-fold” can be affected by this change. Make sure this is not your site. Google’s head of search spam, Matt Cutts, announced that Google has released a refresh of its Page Layout Algorithm. Your home page and other pages on your site need to load fast, the faster the page loads the better for the visitor and if you have your on page SEO and off page SEO right then having a page that loads super fast will also help to get you on the first page. Be careful if you use WordPress choose a light weight WordPress theme and be careful of how many plugins you install. Plugins have scripts and they can also make your page heavy. Image slide shows also slow the page loading time down they look good but use scripts and lots of images. Your home page and landing pages should be super fast. Have only one small image and remember place keywords in the image alt tag. Test your page speed and make sure its fast loading that way the page has a good chance of ranking on page one. Cheap web hosting is no good when you make a website, it will also cause your page to load slow. If you find your hosting is a problem and would like to move let me know, I can arrange to move your site for free to a fast web hosting company. Have a sitemap and submit your sitemap to Google Webmaster tools also submit your sitemap to Bing Webmaster tools. Each time you update a page or build a web page your sitemap will tell Google and Bing, this will help the new page to get indexed quicker in their search results. Also include a link to your sitemap on the bottom of each page on your site. Having a link on the bottom of each page will help search engine spiders crawl your site and discover new content or content that has been updated. Visitors sometimes also use the sitemap to navigate and find more pages on your site. Broken links can damage your on web site. If you have removed a page and still have a link to the page on your site then that internal link needs to be removed. You could also have recommended sites and placed external links in your content and some of those site may no longer exist. Comments on your sites also have external links that might be dead, you need to remove any broken or dead links on your website to prevent them damaging your on page SEO. Its quick with the broken link checker. Another top 10 SEO tip that works great is to have social share buttons on each page of your site. Visitors can then share your content on social networks like Google Plus, Facebook, Twitter, Linkedin etc. This gives the page a nice backlink on the social network it is shared on great for the web page, and could bring some extra traffic your way. Have your own Google Plus, Facebook, Twitter, YouTube, and Linkedin pages include links or buttons on each page of your site, visitors can join you and become followers. Off page SEO is anything you do to promote your website that is not done on your website to improve your web site position in the search engine results page (SERPs). Webmasters associate off-page SEO with link building but it is not only that. Its about promoting different pages on your site – beyond website design – for the purpose of ranking a website higher in the search results. Like building backlinks and promoting your site on social networks. Prepare a detailed link building plan, build your backlinks gradually and steadily a variety of different ways. It must appear to be natural or your off page SEO will fail. The more inbound links or backlinks from a variety of sites that point back to your home page and other pages on your site the better. Think of each backlink as a vote the more votes your site gets the better it will rank on Google. These backlinks should be from high page rank sites to low page rank sites, and from the same niche as your site see below for a guide. About 80% of links should point to the homepage, and 20% – to inner pages of your website. This rule is especially important for large sites with many webpages. If your site is about SEO then find other SEO blogs, SEO articles and try get links from those sites back to your site. Post a comment or contact the owner and ask them if they would link back to your site as its the same topic and their readers could also find your article interesting. Never use the same anchor text in all your backlinks. It has to appear natural and have a large variety of different anchor texts. Getting high quality backlinks is one way to tell search engines about your site and is just as important as good quality content. Build top quality backlinks yourself. Follow our top 10 SEO tips and apply the top 10 SEO tips to your site and in 6 weeks you should see changes for the better, if you would like to have your say please leave a comment that relates to this top 10 SEO tips article.